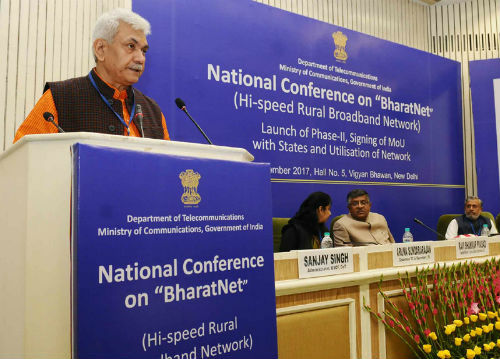 New Delhi: The Union Minister of Communications Shri Manoj Sinha said that government will provide all the necessary and requisite support for fulfilling the dream of a fully connected and truly empowered India very soon. Inaugurating a National Conference on “BharatNet and its Utilization with States” in New Delhi, he said that this is our mission and your vision for the nation. It is equally a call to action for the entire nation, “Connect India”, and then watch India- Create, Collaborate and Conquer. 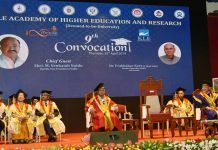 The Minister exhorted that every one of us-the states governments, private sector players, TSPs, Internet, Technology and Digital Services Companies, Media, Academia, Civil Society, Do-gooders, change makers to work together for making this a success. He expressed satisfaction that the Hon’ble Prime Minister’s vision of Digital India is on the right track and Bharat Net is an integral part of that dream. He said, with BharatNet and the Digital India programme, we hope to touch lives, connect people, inform, educate, spread awareness, create jobs, save lives, build relationships, nurture bonds, make significant investments, contribute to the exchequer and the economy and above all bridge the digital divide and amplify financial inclusion. He said that the National Optical Fiber Network (NoFN) (now renamed as BharatNet) project was launched in 2012 with the approval of Union Cabinet provided in Oct, 2011. When it was launched previously it was actually, no fun for any one. Little or no progress had been made. Progress had been rather slow and the actual work on the project commenced only in the second half of 2014. The project involves connecting all the 2,50,000 GPs in the country to the block headquarters for provision of both bandwidth and dark fiber on a universal and non-discriminatory basis. The network is capable of providing scalable bandwidth of up to 1 GBPS. The provision of broadband & internet penetration and e-services has a positive impact on GDP growth besides quicker, transparent and cost effective governance. Shri Sinha said that for the purpose of implementation, the Bharatnet project covering all 2,50,000 Gram Panchayats was divided in to Phase-1 and Phase-2. In the last one year the progress of phase-1 has picked up, tremendously. He informed that for 1,25,000 GPs in Phase-I, the duct/pipe has already been laid in 1,10,368 GPs, OFC laid in 1,03,275 GPs, equipment installed in 85,506 GPs, service ready in 75,082 GPs and service opened in 47,836 GPs. The progress of service readiness has picked up to such an extent that in October, 2017 around 25,000 GPs have already been made service ready. To achieve this the process of equipment procurement was smoothened by decentralising it. Moreover, multi-layered monitoring has been instrumental in achieving this success in the last few months. He said that the Cabinet in July 2017 approved a Modified Implementation Strategy for BharatNet and in the modified, new and improved strategy, the most important change is the Involvement of states along with CPSUs and private sector in implementation of the project to make a win-win situation. The states being the most important stakeholder in provision of bandwidth also stand to gain the most, once this block to GP link is established for citizen centric services such as e-health, e-education, e-governance, etc. The implementation is expected to be much faster and smoother with the participation of states. He said, based on positive response from various states the proposals of Maharashtra, Gujarat, Chattisgarh, Jharkhand, Andhra Pradesh, Telangana & Tamil Nadu were approved by Telecom Commission in September 2017. He complimented the states which provided a detailed project report (DPR) on time and extended their full support in resolving the technical, commercial and financial issues, which are common in projects of this nature, size, scale, scope and magnitude. Shri Sinha said, the major users of this network are the Telecom Service Providers, ISPs, MSOs, LCOs etc which will use the Bharatnet for provision of broadband and extending the mobile network in the rural & remote areas. He said, as the world and India too moves from voice to data, Bharat Net will herald a new era in connectivity and empowerment, reaching the poorest of the poor and every corner of the nation. The Minister said that an important and critical stakeholder and end user of this network are the Government Ministries, Departments & State Governments and expressed hope that the network will be used for various citizen centric services such as e-health, e-education, e-medicine, etc. He urged all the States – whether present here or otherwise to come forward and include BharatNet in their plans in spreading digital literacy, building digital capacity &, proficiency and proliferation of e-gov services. Speaking on the occasion, Secretary, Department of Telecom Ms Aruna Sundararajan said that BharatNet phase-1 is nearing its completion by December 2017, where one lakh Gram Panchayats covering 3 lakh villages will see the roll-out of broadband services. Referring to BharatNet as the world’s largest rural optic fibre network, she said that Phase-2 of the project is 100 percent Made in India as from fibre to design to software everything has been spearheaded by C-DoT. The Secretary said that by 2020 about 25 lakh government institutions and 50 lakh households will be linked to BharatNet. Memorandum of Understanding for implementation of Phase II of BharatNet has been signed with States during the Conference. Keeping in view the Government’s aim to provide affordable digital services in rural areas, the tariffs for utilising BharatNet infrastructure have also been reduced by up to 75% of earlier notified tariffs. Owing to this, the Telecom companies including Airtel, Reliance Jio, Idea and Vodafone have come forward for providing connectivity services utilising BharatNet infrastructure. The Telecom companies like Airtel, Vodafone and Reliance Jio, handed over advance cheques to the Government during the Conference against leasing of BharatNet infrastructure. The service delivery models, which were showcased during the Conference, are set up in collaboration with the Telecom companies. States have also been encouraged to work on such utilization models.